Also in common with neroli, Petitgrain Essential Oil is perfect for skin care since it balances over-active sebaceous glands, reduces spider veins, and acts as a tonic to dry, dull and lifeless skin and hair. Its gentle antiseptic and antibacterial properties protect blemishes, pimples and acne from infection whilst helping soothe irritation and speed up their departure. Petitgrain’s toning action can be used effectively in massage blends for restoring and revitalizing energy levels, and in the battle against cellulite. 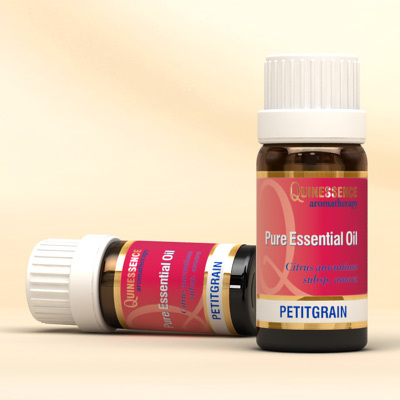 Petitgrain Essential Oil is surprisingly versatile, and like several other essential oils it has the ability to both relax and uplift at the same time. Petitgrain acts as a tonic to the nervous system, helping to combat nervous exhaustion, panic and stress by strengthening the body whilst bringing about a state of deep relaxation. Enjoy its pleasant aroma and revitalizing qualities in massages, baths, skin care and vaporisers.